Awesome, big, and crazy baseball hairstyles and loud uniforms remain my favorite features of 1970s cards. 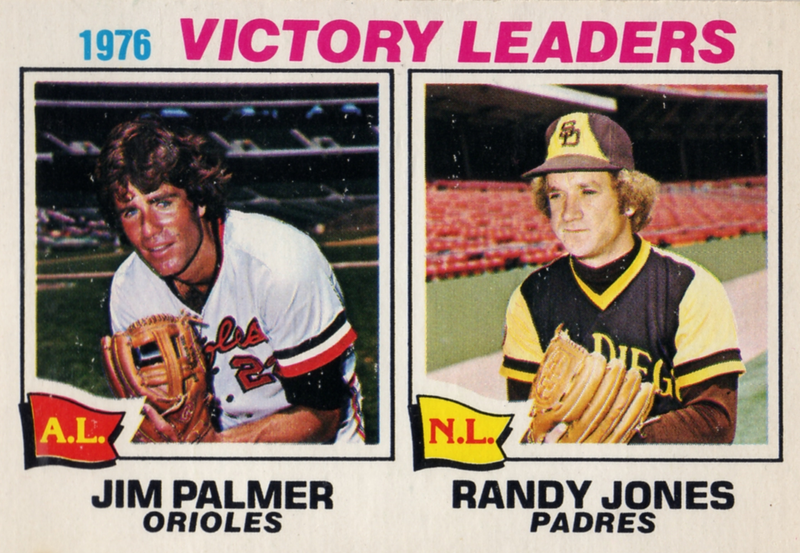 Oscar Gamble led the charge of caps perched on Afros and Cleveland fielded the most garish all-orange outfit, but today's example rates a solid 2-for-2, given Jim Palmer's feathered mop and Randy Jones' chocolate-dipped-banana Padres uni. (3-for-3, if you throw in the blond frizz.) There's zero doubt this card comes from the disco era. 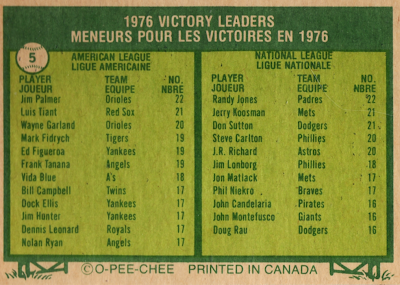 OPC took a more active role in 1977's set design than their card-for-card Topps reprints from previous years. 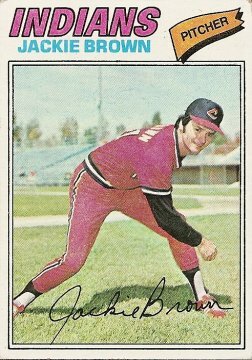 The checklist itself stopped at #264 but also featured a new team in Toronto, so they reworked some multi-player cards into solo Blue Jays. Others got the aforementioned re-cropping and still more dropped distinctive features like the league All-Star banners and All-Star Rookie trophies. (See all these differences in Oh My OPC's 1977 articles.) League leaders cards add only a few French words on the back, along with the usual PRINTED IN CANADA tag line. 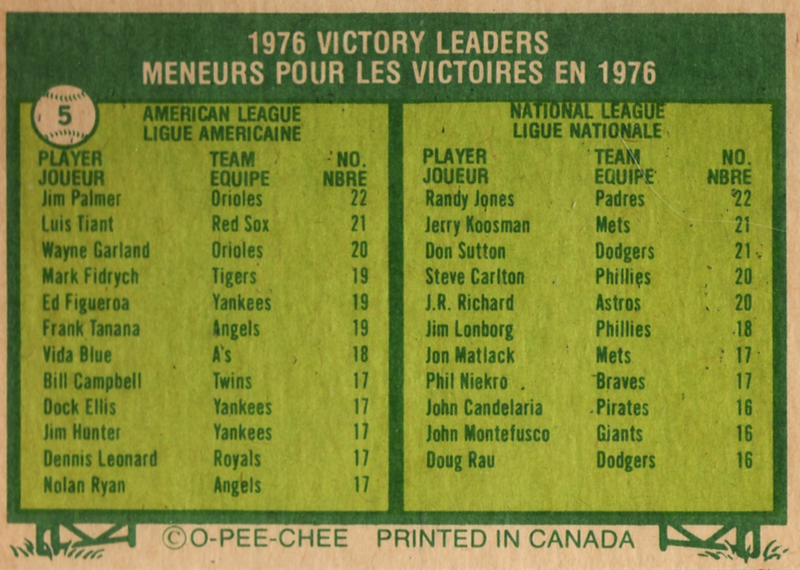 Two names on the leader lists caught my eye, Nolan Ryan (AL, 17 wins) and Jerry Koosman (NL, 21 wins). Card collectors know Ryan's rookie card well (and probably remember Koosman by association) as one of a handful of ungraded Topps to fetch above $1000 back in the market's glory days. It gave you quite a thrill just to pick one up! They still cost a few hundred now, but nowhere near that 4-digit peak. 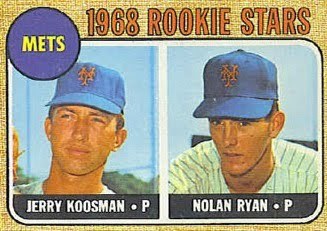 Koosman and Ryan stand remarkably similar by statistical and relative measure. They finished high in Cy Young and even MVP voting multiple times without taking home any hardware. Both struck out twice as many batters than they walked, pitched "above average" for their careers (Jerry at 110 OPS+, Nolan 112), and own nearly identical WHIPs. Outside of raw strikeouts and walks, any 5-season slice from their careers looks almost identical--but Ryan pitched 8 more years than Jerry, helping him win 102 more games and a Hall of Fame nod. Two great pitchers, but one showed extraordinary durability and reaped the honors that went with it. Value: Most OPC cards cost a dollar or two, even with HOFers like Palmer on the front.